This Week for Dinner: Cashew Rice Chex Treats | Casheweroos! 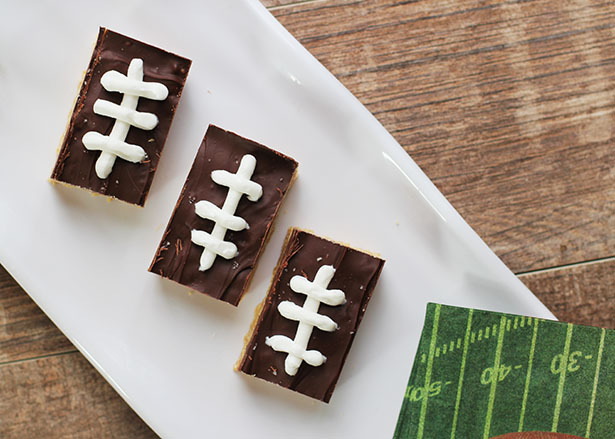 A few weeks ago, the team from Big G Cereals at General Mills sent a cute football-themed package, complete with Rice Chex and ingredients to make treats for Super Bowl Sunday. I recently learned I have a wheat allergy, which means I can no longer partake of all the delicious baked goods I normally make. As a result, I’m now on the lookout for great wheat-free desserts to try to soothe my wheat-free sorrows. When Nate saw the Chex package, he was like “You should make those scotcheroo bar things.” And I was like, “Remember, I’m allergic to peanuts, too?” UGH. Can I eat nothing??? But then I had a thought: cashew butter. And thus Casheweroos were born! And, while casheweroo is fun to say, it’s super hard to spell, so you can also just call these babies cashew rice Chex treats with sea salt, which is kind of a mouthful, too, actually. I’m apparently really good at naming things. 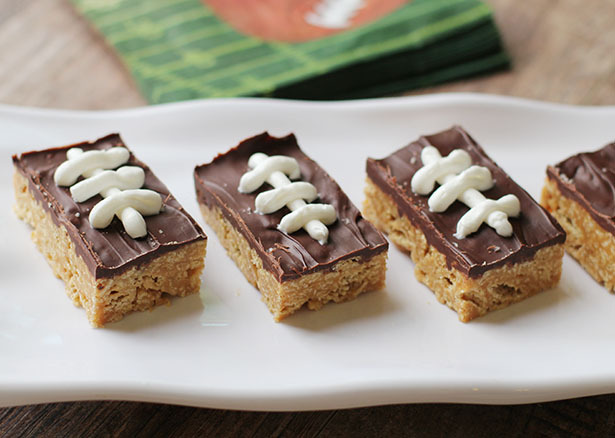 Cashew rice Chex treats are a lot like scotcheroos, except you use cashew butter instead of peanut butter and you sprinkle the top with coarse sea salt to make them extra tasty. Cashew butter is a bit more expensive than peanut butter, but it’s worth it. These treats taste awesome, similar to scotcheroos but without an overpowering peanut flavor, which some people don’t love. 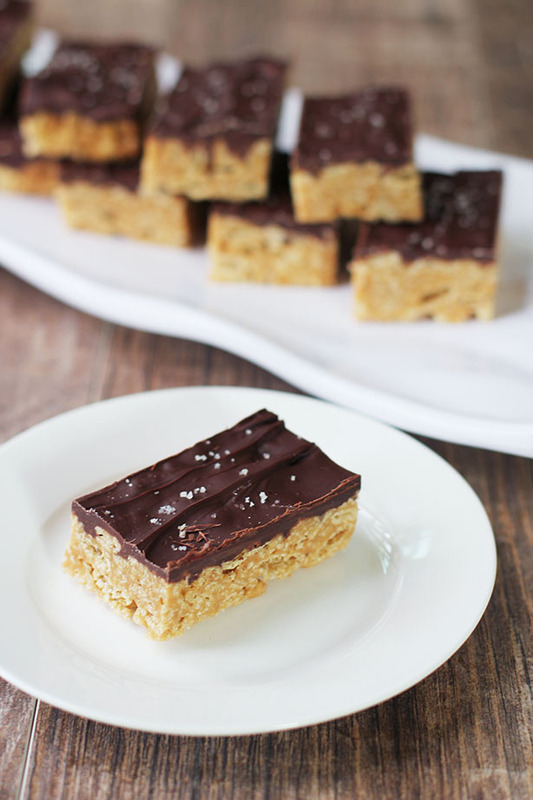 This recipe is perfect for people with peanut and/or wheat allergies, too! For the topping I used one bag of chocolate chips. If you want a thicker chocolate layer on top, feel free to double that amount or do a combo of one bag of semisweet chocolate chips with one bag of butterscotch chocolate chips (which will taste more like scotcheroos). No matter how you decide to do the topping on these cashew rice Chex treats, I promise it will taste delicious! 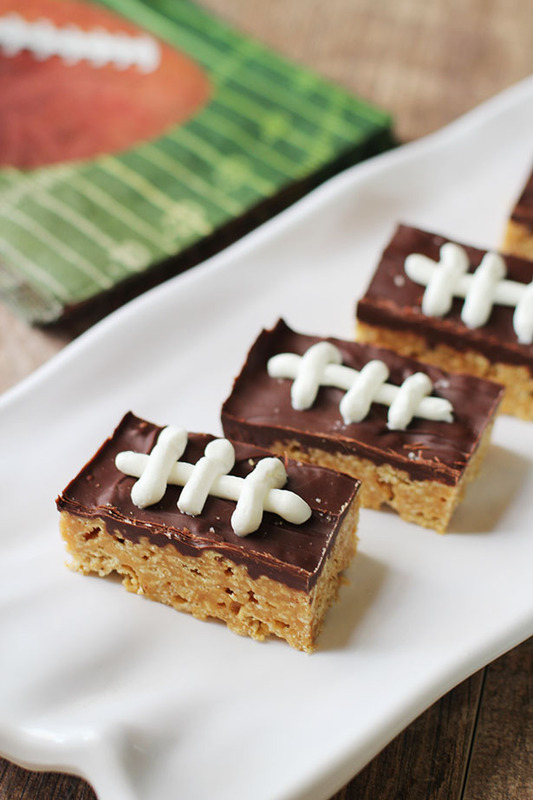 Also, if you are making these for Super Bowl Sunday, you can turn the treats into little footballs with a bit of white frosting. Just buy the frosting in a tube to keep it super simple and fast and draw lines on top of each treat like so. Thanks for the great idea, General Mills! Without further ado I give you Casheweroos! These casheweroos are inspired by scotcheroos, that classic treat recipe that uses peanut butter. With no wheat or peanuts to be seen, this recipe is great for people with those allergies. Butter a 9" x 13" baking pan and set aside. Add Rice Chex to a large mixing bowl and set aside. Mix the sugar and corn syrup together in a large pot. Cook over medium heat until sugars are melted together. Raise heat to high and bring to a boil, stirring constantly. Remove from heat. Add the cashew butter and ¼ teaspoon salt to the pot and stir until well mixed. Pour sugar-cashew butter mixture over the cereal in the mixing bowl and stir until well and evenly coated. Pour cereal mixture into the baking pan and press firmly and evenly into the pan. Getting your hands wet with water helps with the process so the treats don't stick to your fingers as you press. Place chocolate chips in a microwave-safe bowl. Cook chocolate chips on high for 30 seconds at a time, stirring at each 30-second interval, cooking until chips are fully melted. 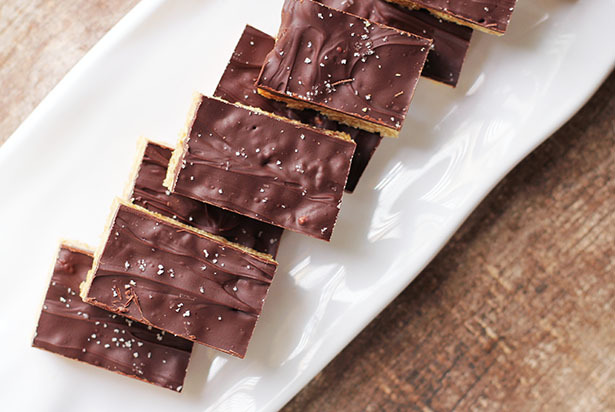 Pour chocolate over the top of the Chex bars, spreading evenly with a spatula. Sprinkle coarse sea salt evenly over the top. Place in fridge until chocolate hardens, about 30 minutes. Remove from fridge and store at room temperature, covered. It is much easier to cut the bars if you remove them from the pan and place on a cutting board. Using a knife, cut all around the edge of the pan then carefully lift the treats out of the pan onto the cutting board. Cut into 6 rows by 3 rows. Optional: If you want a thicker chocolate topping, use two bags of chocolate chips. 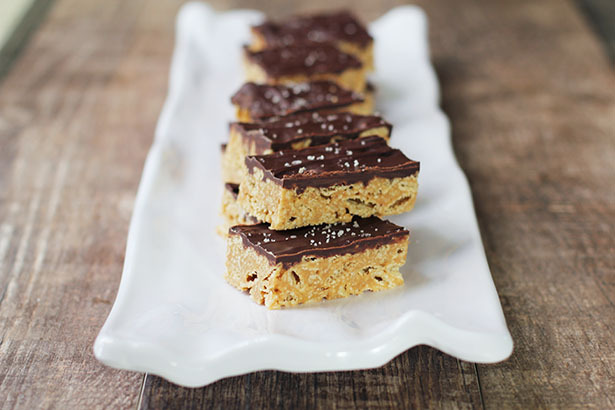 If you want the topping to taste more like the original scotcheroo treat that inspired this recipe, use one bag of chocolate chips and one bag of butterscotch chips. these rice chex crispie treats were the bomb!!!!! amazing!!!! !